The Grove neighborhood in St. Louis, also known as Forest Park Southeast, is located between Vandeventer Avenue and Kingshighway, just south of the BJC and Washington University Medical School campus, as well as the more recently developed Cortex Innovation Community. Like many urban neighborhoods, the Grove has had periods of bustle and decline throughout its history. When it was originally called Adam’s Grove in the 1950s, the neighborhood was a thriving commercial district. After experiencing decline in the following decades, the area experienced a turnaround in the 1980s coming from investment from several LGBT-friendly businesses. That was followed by continued investment from the community and entities including the Washington University Medical Center Redevelopment Corporation and the Grove Community Improvement District, which began filling vacant storefronts, homes and businesses. That investment has accelerated in recent years, as the community began preparing for the opening of the nearby Cortex MetroLink Station, scheduled for July 31. 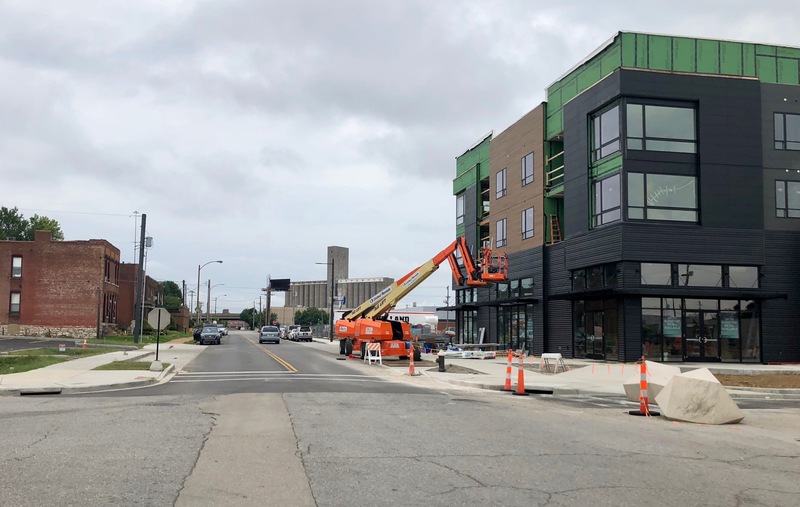 One of the most notable newcomers to the neighborhood is CHROMA, a 235-unit mixed-use complex on Chouteau Avenue between Vandeventer and Sarah Street, developed by Green Street St. Louis and Koman Group. 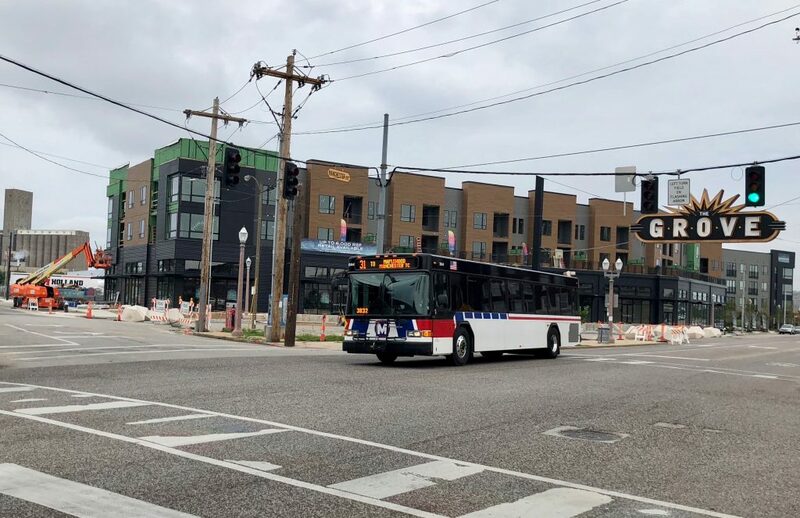 With construction wrapping up, residents have already started moving in and will soon be able to enjoy a short walk to the Cortex MetroLink Station. The project also includes a courtyard with resort-style pool, parking garage, fitness center, private dog park and spa, conference room and business space, independent workspaces, and a community clubroom. The 18,000 square feet of first floor retail space will activate the corner with an attractive storefront for pedestrians getting around the Grove and traveling to and from the Cortex MetroLink Station. One retail tenant already secured is Chao Baan, a Thai restaurant operated by local restauranteurs, which will take up 3,900 square feet. Another boost for pedestrians will be the newly expanded “Chouteau Plaza” in front of the building. The developers have closed off a short portion of Chouteau between Sarah and Manchester to create a unique space designed for public use and community programming. Green Street and Koman Group are also teaming up to make improvements to the Sarah Street corridor between Manchester and the new MetroLink station. The Sarah Street St. Louis Project, where “Culture Meets Innovation,” is an initiative designed to connect The Grove and Cortex communities through public art and infrastructure. The planned streetscape improvements include sculpture and lighting installations, landscaping, dedicated bike lanes, and road resurfacing. Station G in The Grove at 4427 Chouteau, the former Laclede Gas Light Co. Pumping Station, has long been awaiting redevelopment. The recent economic boom in the neighborhood has attracted the attention of St. Charles-based Greater Goods, an online retail product company, to redevelop the building to house its headquarters. Renderings reveal a preserved exterior, but an exciting change of the building’s interior with a modern twist, including white tile walls, open staircases, skylights and a mezzanine level with enclosed conference rooms and catwalks. There will also be a show-kitchen and show-bathroom to highlight the company’s products. In addition, the Greater Goods homebrew club will operate a brewery in the basement. This development will add to the 24-hour feel of The Grove, bringing daytime office workers to a part of the neighborhood that is mostly residential. Patrick Kohm, Senior Marketing Analyst at Greater Goods, noted why the company chose this spot for its headquarters. Neighborhoods that encourage walking, biking and transit don’t happen on their own without forethought and planning. The Grove neighborhood stepped up to ensure that future development in the neighborhood would contribute to the walkable, transit-friendly nature of the area. The neighborhood adopted form-based code that puts in place design standards and basic zoning rules that enhance the urban character of the arterial streets and contribute to the visual appeal of the community. The design of buildings and how they interact with the sidewalks and roads has a huge impact on making it appealing, comfortable and safe to walk and take transit.